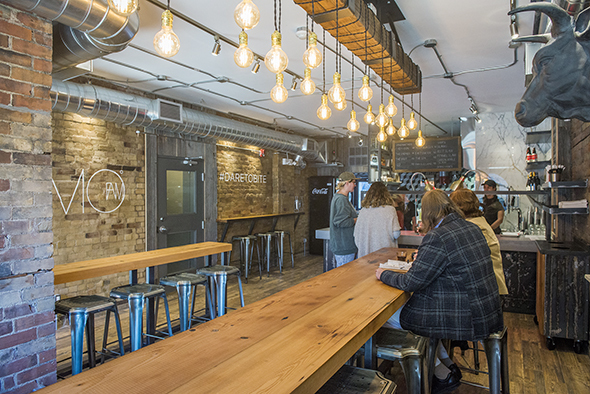 FAMO Sandwiches is doing something really commendable in Toronto: making appealing sandwiches out of alternative cuts of meat. Lesser eaten meats like cheek and oxtail star, which is great: it saddens me to think of any animal sacrificing their delicious body only to have the scrumptious tongue scrapped. 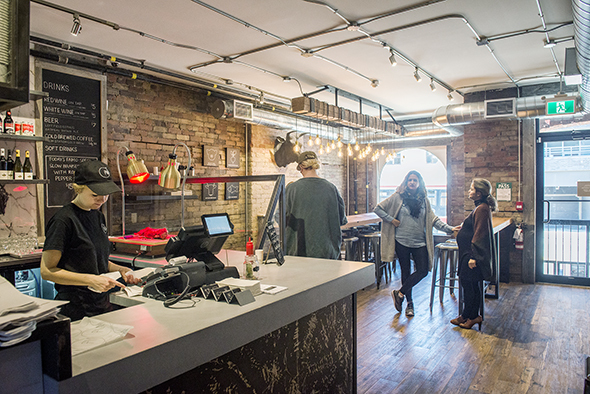 The name FAMO comes from combining the last names of partners and co-owners Shabnam Moier and Babak Fami, and also sounds fancy, famous and intriguing. 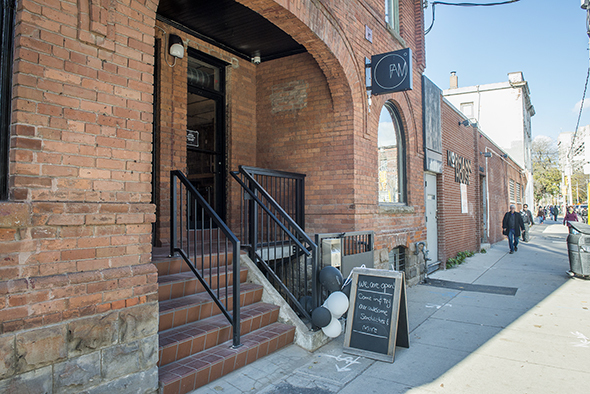 The restaurant near Queen and Sherbourne has a long communal wood table in the middle of the place which abuts the front window with high seating surrounding it. 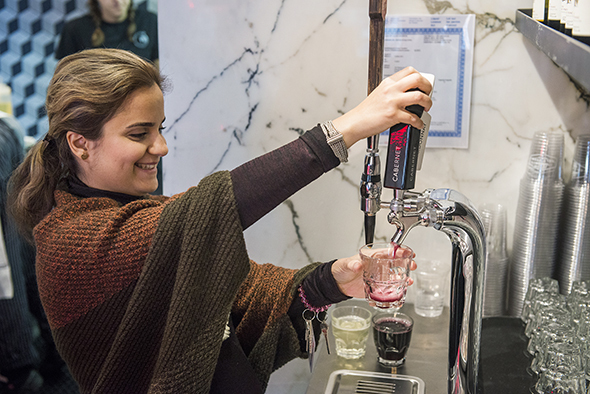 The cold brew on tap ($4.50) is from Station , and your choice of red or white wine is from Vineland ($5). Served in stout little glasses, it's not too out of place with the metal lunch trays and paper placemats in here. They also serve Left Field beer. The Six ($13) is beef tongue braised for hours in red wine. 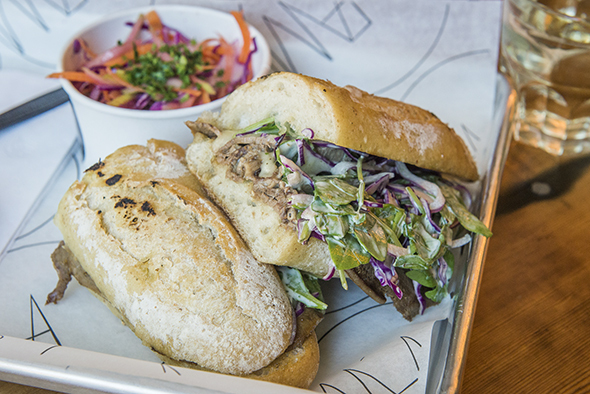 This is one of Fami's very favourites, on Thuet French bread topped with an arugula slaw. Peppery arugula jives well in creamy slaw, topping rich meat. 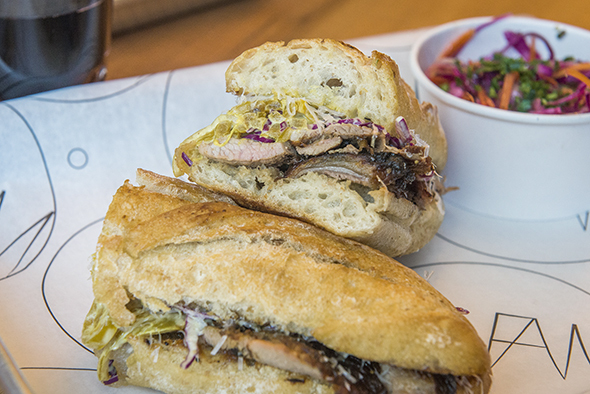 Each sandwich is paired with your choice of side, and we get sweet green apple slaw with this one. 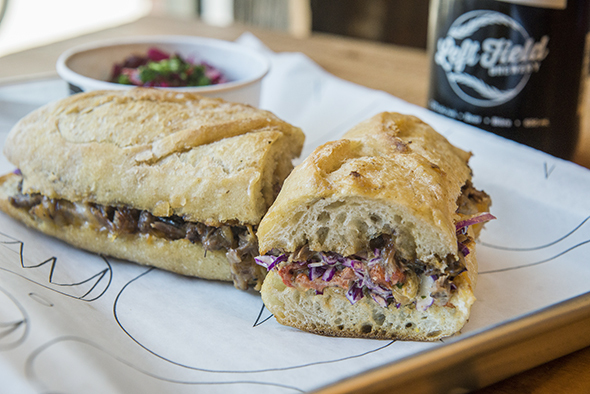 They have specials up on a chalkboard, and we opt for the slow braised oxtail with roasted pepper slaw ($15). On the side of this one we get the beet slaw with red cabbage, brightly purple and vinegary with pickled beets. This oxtail special is a little more plain than the tongue, but pairing it with sour beet slaw cuts through any blandness well. The Famous Lamb ($13) is roasted in foil with cloves, cinnamon and cardamom which gives it a wonderful sweet savouriness, and it's carved into thin strips in front of you before going on a sandwich with turmeric caramelized onions. Representative of Moier and Fami's Persian background, the potent onions combine well with aromatic lamb. 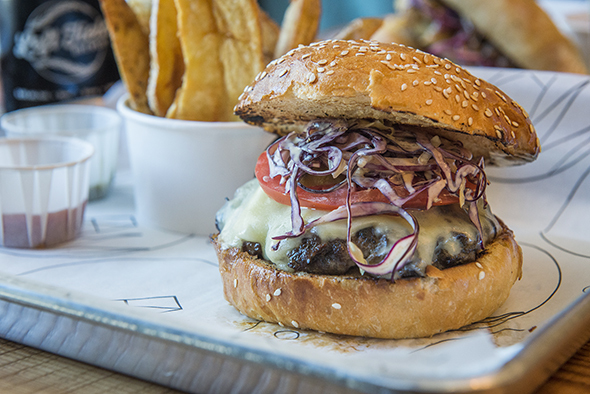 Yes A Burger ($12) is on their menu, literally written that way. I prefer the more original sammies, and though the brisket chuck beef burger is admirable, it's just a touch over where I'd like it to be. I'm glad we got the fingerling fries, though, which are chunky and golden. 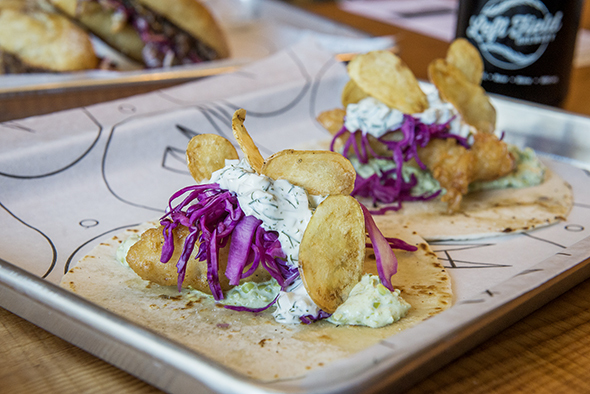 Don't miss The Brit ($12), fish tacos with light breading, homemade tartar sauce, homemade fingerling potato chips for crunch and a little slaw for acidity. Give the homemade grilled jalapeno hot sauce a try too! In addition to masterminding the menu, Fami had a hand in design touches like a large decorative bull's head and funky lighting wrapped around large hanging beams. His kitchen is open for all to see.